Every Wednesday night during the six weeks leading up to my flight to South Africa I was enthralled by the BBC’s series ‘Africa’ hosted by Sir David Attenborough. It provided a perfect pre-safari build up. Having booked a stay at Thonga Beach Lodge with the sole purpose of having a chance to see turtles I was particularly interested in the episode featuring these rare and elusive reptiles. Realistically though my chances were limited. My stay was short and it was right at the end of the season for both egg laying and hatchlings emerging. I had wanted to visit the lodge for a long time and at last here was my opportunity. 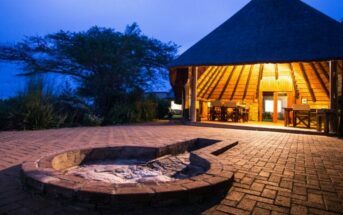 Set on the province’s pristine Maputoland Coast, north of Sodwana Bay, the lodge is one of very few places to stay, directly on the beach, anywhere in KwaZulu Natal. Take into account that this is also within the Isimangaliso Wetlands World Heritage site and it all adds up to a very special destination. Within the huge vegetated sand dunes the twelve room lodge is hardly visible and has barely any impact on its incredibly scenic location. Each individual beach-bush suite is spacious, fully self contained, and comes complete with a stunning ocean view. There are pure white sand beaches, dunes, tropical vegetation and ocean providing the surrounding backdrops. The lodge also has its own swimming pool, enclosed restaurant, outdoor dining area and bar. Andy & Maryke were great hosts and the recommendation by Andy for dinner was perfect for the venue. Grilled sole on a lemon & cherry tomato risotto, with sautéed vegetables, topped with white wine & dill sauce served to the sound of the ocean. On arrival at the lodge I immediately checked out the activities board and booked myself on that evenings ‘turtle tour’ and a trip to lake Sibaya for the following morning. There was also kayaking on the lake, forest trails, ocean safaris and scuba diving. I have not dived for many years but I am told that the diving off this section of coast is some of the best in the world. All I could see was a hole about the same diameter as a baked bean tin and what looked like a dozen pebbles slowly rolling away from it. Beki parked up, we disembarked, and walked back towards the hole. The next hour was like a trance. I stood with my fellow turtle trekkers and watched over seventy tiny loggerhead hatching turtles emerge and slowly make their way towards the sea. Because of our presence predators stood clear and allowed every one to make the journey safely across the sand. It was truly amazing to watch. Each hatchling seemed to scurry for a few feet, stop, take a breath, and then continue. Every now and then some turtles would catch a gust of wind under their miniature flippers and be flung onto their shells. We ourselves were being sand blasted and exfoliated by the wind fuelled sand. On reaching the ocean, waves washed the turtles clean of sand, and carried them back onto the beach setting them back fifteen to twenty feet. Deep breath and back again towards the surf they headed. We waited until each and every one had completed their first epic journey. It was a truly memorable ‘Africa moment’ recreated. 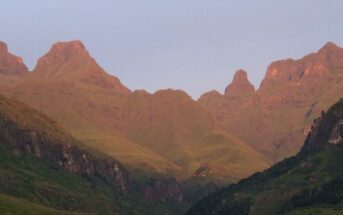 The following morning after watching the sun rise over the Indian Ocean horizon I accompanied Thulani, my guide, to Lake Sibaya. The twenty five square mile fresh water Lake, with water berry groves on its surrounds, resembled the ocean. Hot sun and blue sky had returned but the wind was still present creating choppy conditions. Here we found a wealth of bird life including Common Terns, Egyptian Geese, Orange Breasted Long Claw and White Breasted Cormorants. 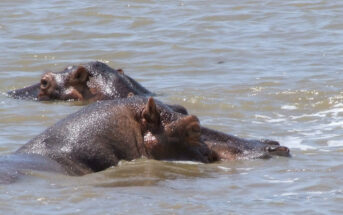 Hippos and crocodiles are also residents but proved difficult to spot. We did manage to catch sight of a large catfish swimming close to shore, the crocodile’s staple diet.